8.5 oz of washed curls takes about 2 days to process. Washed curls are combed and drawn out into top. The comb dregs are carded into rolags. 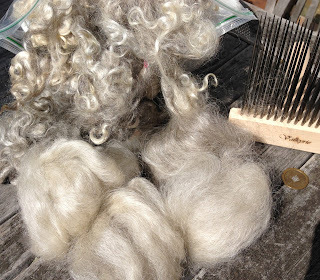 Here we have curls on rolags, next to combed top. This afternoon the rolags will be spun long-draw. My TdF might be over in a week. Nevermind - I just thought of another spinning project.